How DevOps will help you surpass the common challenges of financial services software development. 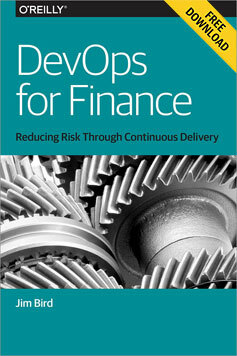 Download a free copy of DevOps for Finance, an O’Reilly report by Jim Bird for the financial services software insider who’s heard about DevOps, but is unsure whether it represents solution or suicide. DevOps, until recently, has been a story about unicorns. Innovative, engineering-driven online tech companies like Flickr, Etsy, Twitter, Facebook, and Google. Netflix and its Chaos Monkey. Amazon deploying thousands of changes per day. DevOps was originally about WebOps at Internet companies working in the Cloud, and a handful of Lean Startups in Silicon Valley. It started at these companies because they had to move quickly, so they found new, simple, and collaborative ways of working that allowed them to innovate much faster and to scale much more effectively than organizations had done before. But as the velocity of change in business continues to increase, enterprises — sometimes referred to as “horses,” in contrast to the unicorns referenced above — must also move to deliver content and features to customers just as quickly. These large organizations have started to adopt (and, along the way, adapt) DevOps ideas, practices, and tools. The tradeoffs of (accidentally) discarding continuous integration. That revelation surprised Martin: in his mind, software development was a discreet, scientific, deterministic process, not at all represented by the vague comments of these developers. But the practice of as-late-as-possible integration was common back in an earlier era of software development. If you look at software engineering texts of the ’60s and ’70s, every project included an integration phase. This isn’t how we think of integration today, which happens at the granularity of services and applications. Rather, a common practice was to have developers code in isolation for weeks and months at a time, then integrate all their code together into a cohesive whole. And that phase was, not surprisingly, a painful part of most projects. Yet, that type of 60s and 70s workflow is still codified in some version control tools today, even though we have now determined that late integration is the opposite of how we should approach this problem. dategrep — print lines matching ranges of dates. Genius! Business Case Guidance in Agile Projects (gov.uk) — how the UK govt signs off on Agile projects, which normally governments have no clue over how to handle properly. Hyper Growth Done Right — “While I was at Oracle, it took a month before a new engineer would get any code in,” Agarwal says. “It sent this implicit message that it’s okay to take a month to write some code.” First time I’d heard this wise point articulated: slow feedback loops send the message that progress can be slow. Docker + Github + Jenkins — clever integration of the three tools to get repeatable continuous integration. The modern dev environment has workflow built on git, VMs, and glue. On the NSA — intelligent unpacking of what the NSA crypto-weakening allegations mean. Easy 6502 — teaches 6502 assembler, with an emulator built into the book. This is what programming non-fiction books will look like in the future. Kochiku — distributing automated test suites for faster validation in continuous integration. Why I Hate The STOCK Act (Clay Johnson) — an attempt to reform insider trading within government, but because Congress exempts itself from substantial penalties then it has little effect where it’s needed most. We won’t see change on the issues that matter to us (copyright, due process for Internet takedowns, privacy, etc.) while the lawmakers are distracted by money. Instruction Medium is the Message (Dan Meyer) — Print is a medium. Same as digital photos. Same as a teacher’s voice. Same as a YouTube video. Same as a podcast. These are all different media. And as we know, the medium is the message. The medium defines and constrains and sometimes distorts the message. The math that can be conveyed in a YouTube video is not the same math that can be conveyed in a digital photo or a podcast or a print textbook. Anything that can be replaced by a computer should be; it’s doubtful that successful widespread education consists only of things a computer can replace. Eolas Patent a Hollow Victory (Simon Phipps) — those who were extorted by the patent troll will go uncompensated, and the loss of one patent leaves their business model still intact. The patent system is extremely broken in the US, it’s a giant cost of doing business, a regulation-created tax that is paid to trolls instead of to the US Government. What idiot supports a tax that doesn’t go to the government? An ethically-corrupted one (see point 1 above). Late to Hulu Means More Piracy — more evidence that price isn’t the main reason people pirate. If they can get it legally online in a convenient fashion, they will. If you delay online release, or make it inconvenient, your erstwhile customers will turn to piracy because “it’s illegal” is less important than “it’s convenient”. Welcome to the modern world, Fox, please use the designated bin to dispose of your buggy whips. Designing Github for Mac — a retrospective from the author of the excellent Mac client for github. He talks about what he learned and its origins, design, and development. Remember web development in 2004? When you had to create pixel-perfect comps because every element on screen was an image? That’s what developing for Cocoa is. Drawing in code is slow and painful. Images are easier to work with and result in more performant code. Remember these days? This meant my Photoshop files had to be a lot more fleshed out than I’ve been accustomed to in recent years. I usually get about 80% complete in Photoshop (using tons of screenshotting & layer flattening), then jump into code and tweak to completion. But with Cocoa, I ended up fleshing out that last 20% in Photoshop.